What does it mean to be before the image as before the law? What are the singular and collective responsibilities when making and watching images? What does entering through the open doorway mean, if we take this entering into a relationship with the image not as a given, but as a task? Let us stay longer with Huberman. Elsewhere, he has made a comment that “there exists no image that does not simultaneously implicate gazes, gestures, thoughts” (Didi-Huberman, 2009, 39) and that, consequently, the question of a truth of images or of images as truth producers, detours from asking questions of knowledge, power and violence, through and with images. The fictions that images produce and the fictions they enter or compose through their movement then become our doorways. Being before the image as before the law then implies being before one’s own gaze, gestures, thoughts, one’s own fiction. Yet, at the same time, being before all of the fictions, gestures, thoughts that all the temporalities in the image bring forth or conjure. “But how are we to be equal to all the temporalities that this image, before us, conjugates on so many levels? And first of all, how are we to account for the present of this experience, for the memory it evoked, and for the future it promised?” (Didi-Huberman, 2003, 35). Where does this take us? What can we do with images in the contemporary? What can we do with images in a time-space that we call the contemporary, a time-space which we are yet to make sense of? Peter Osborne offers an extra proposition to add to our questions: the concept of the contemporary functions as if there is a “socially actual shared subject-position” and “as if the speculative horizon of the unity of human history had been reached.”(Osborne, 2013, p.23) The fiction of the contemporary has its own dialectical movement, from its negative understanding as disavowal, to its potential as a productive act of imagination, and as a task. Osborne goes further to offer that “all constructions of the contemporary are fictional” (Osborne, 2013, 25) specifically because of the asynchronous temporalities enacted in the contemporary, yet promising to offer certain forms of synchronicity. Then, how do we perform and stand before constructions with images in the contemporary? 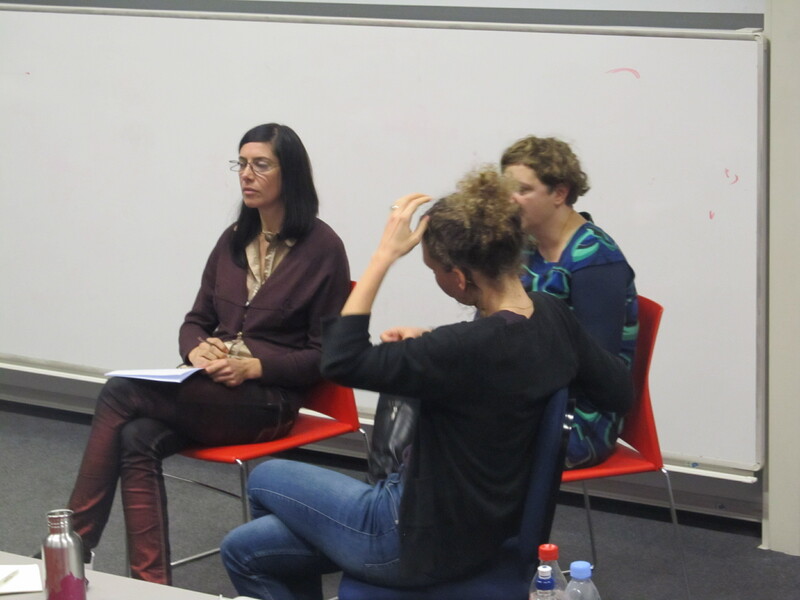 Knowing, feeling, voicing, noticing the emergence of gestures, drafting vocabularies, repositories, re-presenced movements and stillness are all worked through images in the recent practices of the artists invited in this event. Their compositions ask necessary questions on power, violence, protest and their gestures and fictions. They question, in specific modes, events and temporalities, and allow, through acute observation and attentive work on images, for the sense that we need to take responsibility of our being before the image today, as much as yesterday, to emerge. Georges Didi-Huberman, “Before the Image, Before Time: The Sovereignty of Anachronism,” from: Claire Farago and Robert Zwijnenberg, eds,Compelling Visuality: The Work of Art in and out of History , Minneapolis: University of Minnesota Press, 2003, 31-44. Peter Osborne, Anywhere or Not At All. Philosophy of Contemporary Art, Verso: London, 2013. Deep State, Karen Mirza and Brad Butler, 2012, 45 min. Deep State is a film by Karen Mirza and Brad Butler that has been scripted in collaboration with author China Miéville. The film takes its title from the Turkish term ‘Derin Devlet’, meaning ‘state within the state’. Although its existence is impossible to verify, this shadowy nexus of special interests and covert relationships is the place where real power is said to reside, and where fundamental decisions are made – decisions that often run counter to the outward impression of democracy. Amorphous and unseen, the influence of this deep state is glimpsed at regular points throughout the film – most clearly surfacing in its reflexive responses to popular protest, and in legislated acts of violence and containment, but also rumbling and reverberating, deeper down, in an eternally recurring call-and-response between rhetorical positions and counter-languages, in which a raised fist, a thrown rock, a crowd surge, an occupation provoke a corresponding reaction in the form of a police charge, a baton attack, a pepper spray, assassinations. Ein bisschen eine komplexe Situation/A mass is gathering outside, Elske Rosenfeld, 2-Channel Video Installation, 2014, 15 min. 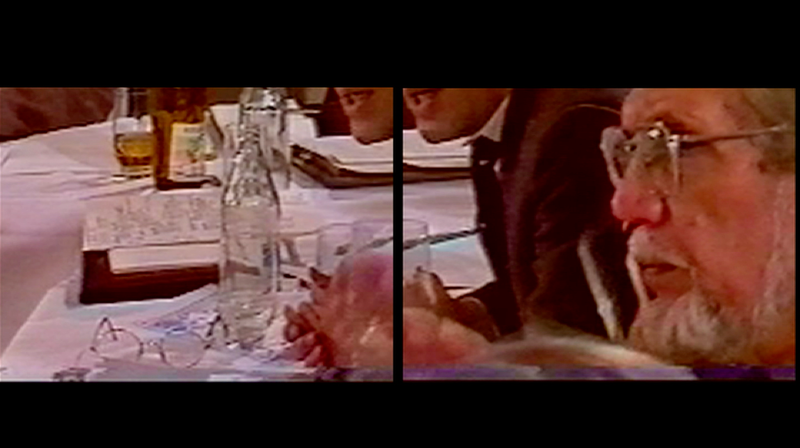 An intervention into footage from the first meeting of the Central Round Table of the GDR, October 1989. In a 10-minute scene, participants are trying to agree on a response to a demonstration that is passing the building. Sounds from the demonstration can be heard ebbing and swelling outside the window, as the participants debate. The demonstrators are never seen, only heard. The 2-channel projection shows the scene in its entirety. It unfolds as series of intervention into the material that are themselves based on motions and gestures taken from the footage: pans, zooms, the shaking of the camera, the gestures and movements of the participants, the different qualities and sources of sound. These are amplified, repeated, looped, in order to confront and confound notions of an inside and an outside, language and body, representation and embodiment. 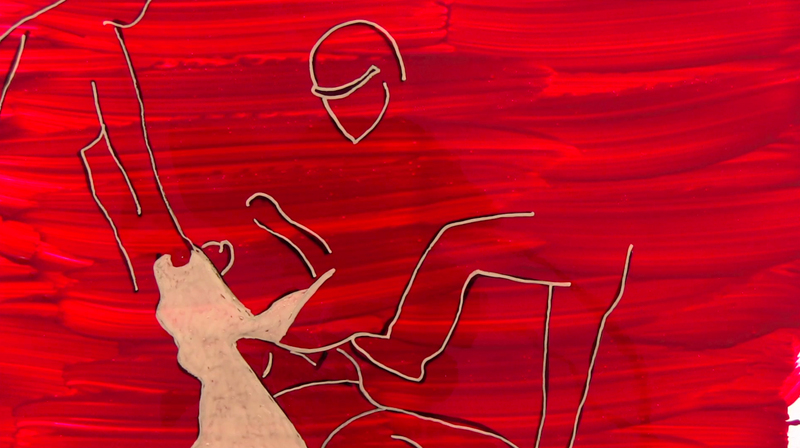 GUESTures, Margareta Kern, 2011, excerpt (12min). 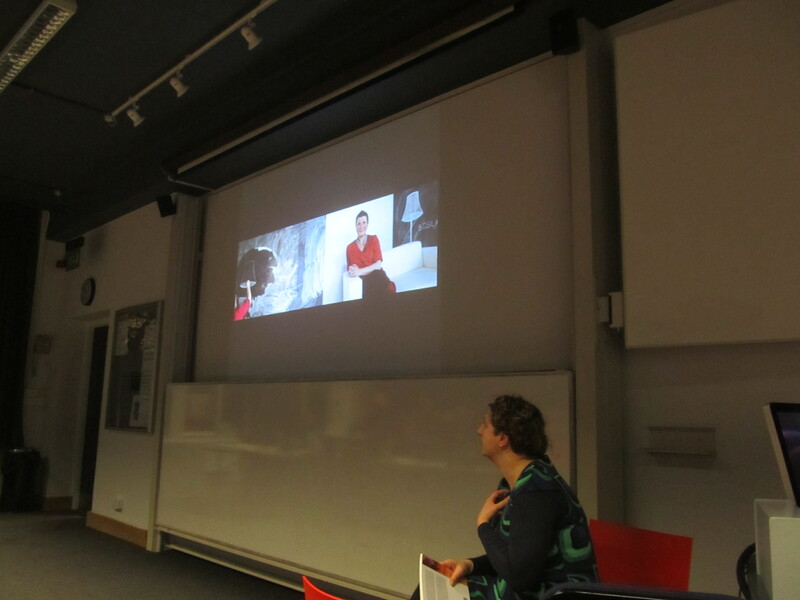 Double-screen video GUESTures (GOSTIkulacije) stems from artist’s research and interviews with migrant worker women in Berlin, who were part of an organised mass labour migration, from the socialist Yugoslavia to West-Germany. Words of three women who left Yugoslavia in the 60s and 70s to work in a television factory in Berlin are re-enacted by actress Adna Sablyich. 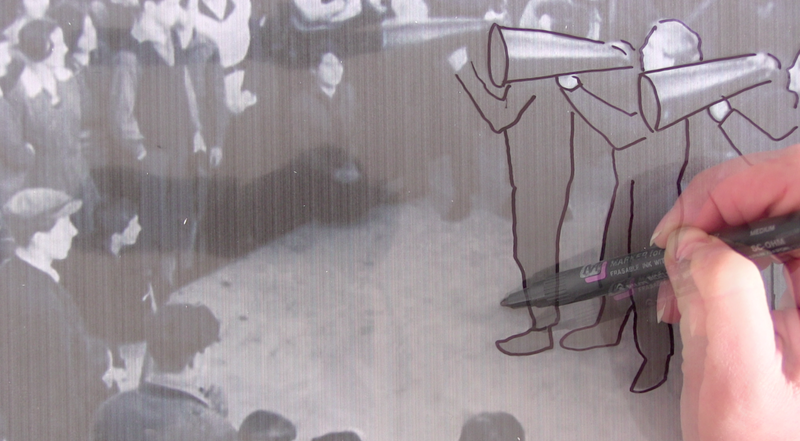 The video both follows and subverts the impulse of verbatim theatre and documentary film genre for ‘authenticity’ by employing a range of tactics, from subtle interferences and pauses in actress’ speech, to the inclusion of the artist and archival material from the factories in which the migrant women worked. The Body State, Margareta Kern, 2013, 9min. The Body State video by Margareta Kern casts unruly bodies in action, as they struggle to speak out and resist. A drawing of a woman’s body being dragged away from the crowd is sharply juxtaposed with shouts and bells of the stock exchange, plunging us from silence into the violence of a speculative economy of global finance. Police footage of the student protest in London has been hacked, slowed and splashed with white paint, like the paint bombs thrown on the policemen’s visor; all the while a disembodied narrator’s voice indexes body parts. Scratching, glitching and failures, all point to a possibility of a crash in the system, a cut in the frame, an opening for a different light to pierce through and be animated. Total screening time: 81 mins. A woman refuses to go back inside the factory after the end of a strike in 1968 in France. A woman is trying to make a proposition at a revolutionary meeting in 1989 in East Berlin. Two women circle Tahrir Square in their car after the end of a last bout of protests in 2012. The performance functions as an intervention into three documents of political events that are held together by the physicalities contained in the material. It plays with components of the material itself (images; sounds; movements, postures, and gestures of the figures, the camera, and objects in the footage), which are reworked into a dramaturgy of repeated interventions into and actions in front of the projected material. Text and speaking (the performance script) is another layer of material that is treated as another area of formal intervention. 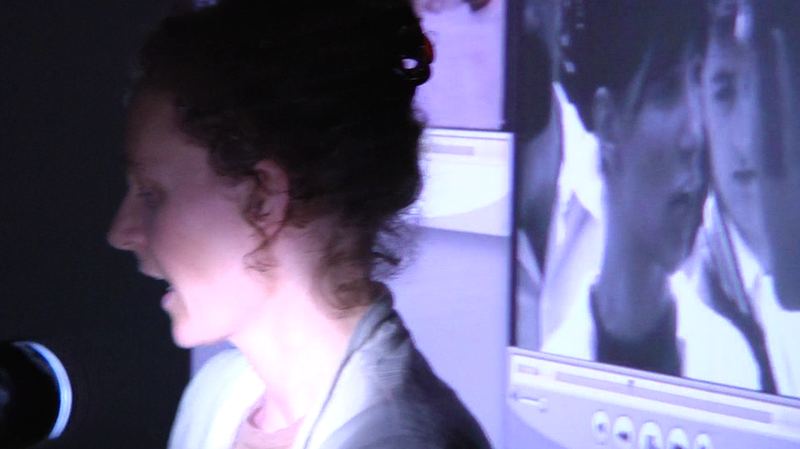 The performance was first developed as a contribution to the conference “The Event”, Amsterdam University and Rietveld Academy, in March 2013, (where it tried to propose a concept of the “Event” in response to the formal settings of a conference) and has been reworked for different contexts since then. 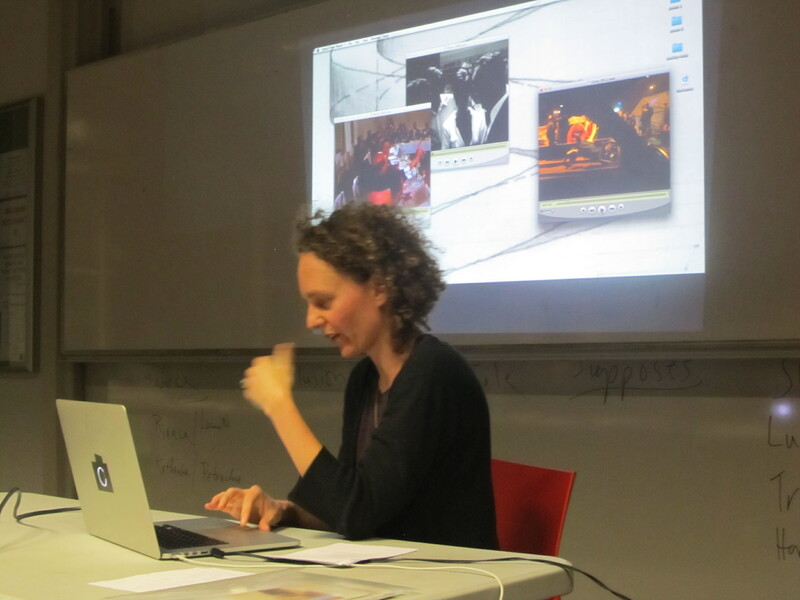 Elske Rosenfeld (born 1974 in Halle/Saale, GDR) uses video and performance, as well as different formats of writing to investigate the relationship between specific historical, as well as contemporary scenarios of political upheaval, and their potential for affecting political change. 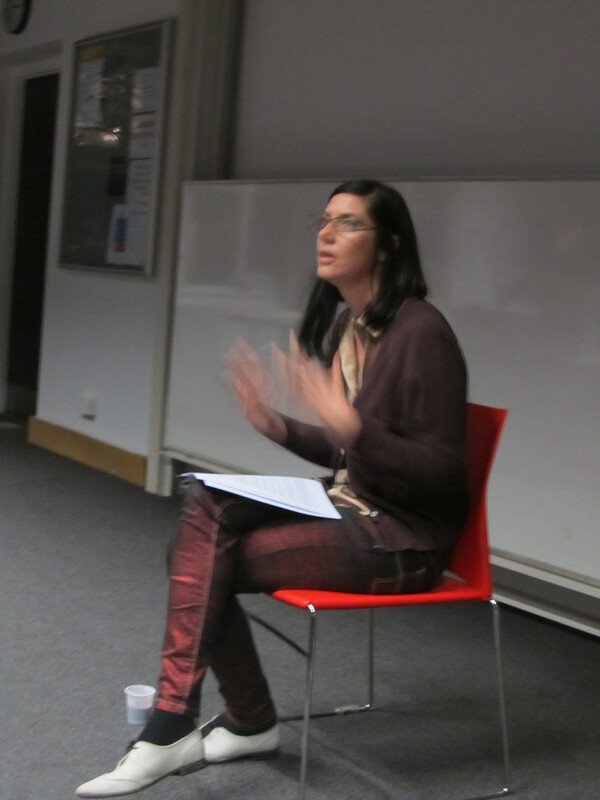 Using archival material from the history of the state socialisms of Eastern Europe and their forms of dissidence, as well as her own biographical investment in these, she reworks the juncture between the utopian promise of the political project of communism and the concrete mechanisms of its failure, as a space from where to reconstruct concepts of the Political for the present day. Recent works have focussed on the gestural content of archival footage from situations of revolution or protest to develop abstracted interventions into and around these materials. Rosenfeld lives and works in Berlin and is has just completed her PhD-in-Practice at the Academy of Fine Arts in Vienna, for which she received a DOC-Fellowship of the Austrian Academy of Sciences. Her work has been presented internationally in institutions including the Mumok, Vienna; Kunsthalle Exnergasse, Vienna; GfzK Leipzig; tranzit, Cluj, Romania; Devi Art Foundation, Delhi; the education programme of documenta13; Swiss off-site Pavilion, Venice Biennial 2011; Vienna Art Week 2011; BAK, Utrecht; Shedhalle, Zürich; among others. She has taken part in international residencies, such as the Visual Arts residency program at the Banff Centre for the Arts in Canada. Her texts have been published in/on eipcp.net, Reviews in Cultural Theory, Springerin – Hefte für Gegenwartskunst, and other publications. Still from The Body State, Margareta Kern, 2013. One of the first images in Kern’s video The Body State is a one-frame still from the film made in 1931: Kuhle Wampe, or Who Owns the World?, produced by the collective that included Brecht, Dudow and Eisler. The image shows the group Red Megaphone in the moment when they are performing in a public space, being ‘…the megaphones of the masses…’. In its use of stage-ing and montage, and by dealing with issues of unemployment, suicide, crises and collectivity, the film serves as a starting point and an anchor for Kern’s series of videos, of a similar title To Whom Does the World Belong? In her presentation Kern will speak about different registers and gestures used in her work, in particular thinking through the role of images in our current crises – of collectivity, – with/in capitalism, and – representational crises. Margareta Kern (1974, Bosnia-Herzegovina/Croatia/UK) is a visual artist, whose practice engages with the social and political through multi-layered and inter-disciplinary projects. Kern is interested in the relationship of image-making to performance, narrative and participation, as well as in the relationship of art and activism. Her work to date has engaged with intimate spaces and narratives, and with questions around visibility, power and representation. Karen Mirza and Brad Butler‘s multi-layered practice consists of filmmaking, drawing, installation, photography, performance, publishing and curating. Their work challenges terms such as participation, collaboration, the social turn and the traditional roles of the artist as producer and the audience as recipient. Since 2007, Mirza and Butler have been developing a body of work entitled the Museum of non Participation. The artists have repeatedly found themselves embedded in pivotal moments of change, protest, non-alignment and debate. Experiencing such spaces of contestation both directly and through the network of art institutions, Mirza and Butler negotiate these influences in video, photography, text and action. Recent exhibitions include The Museum of non Participation: The New Deal at the Walker Art Centre (April – July 2013), Performa 13 (2013) and Derin Devlet (Deep State) at Galeri NON (Jan – Feb 2014). The Museum of non Participation is nominated for the Artes Mundi Award 2014 for visual artists who engage with the human condition, social reality and lived experience.